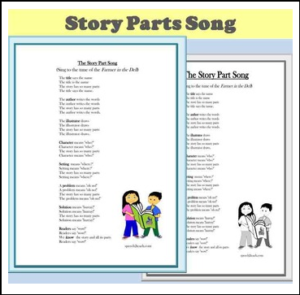 A catchy song (sung to the tune of Farmer in the Dell) that will help little ones remember important story elements. This song covers the terms “title”, “author”, “illustrator”, “character”, “setting”, “problem”, and “solution”. Both color and black printables. Hands on Story Mapping with Story Stickers Students will love labeling picture and text clues with stickers that can be placed directly into any book. Use these to facilitate discussion about story elements such as character, setting, problem, and solution. Perfect for small group activities or incorporated into a reading center. Go to your My Purchases page and click on the Provide Feedback button. Click it and rate the product you purchased. You can also leave a short comment. Once you’ve left feedback, you’ve earned your points. Find out about new products and special offers by following our store. Look for the green star at the top of the page, next to the store name. Click it and become a follower. Note: you will be able to adjust the email settings and select what information you wish to receive.